As an Urban Farming and Horticulture instructor in space deprived Hong Kong, I’m often asked about using the much hated bay windows common in many Hong Kong apartments for growing vegetables. The main considerations growing edible plants indoors are limited space, light and airflow. I set out to design a highly functional indoor growing system that would not only address these issues, but also be sustainably built and have a minimalist aesthetic. The key factor limiting the growth of edible plants indoors is lack of sunlight. Artificial light, while very helpful, creates two issues of its own. First, it consumes electricity, thereby reducing some of the environmental benefits of growing your own vegetables. Second, they must be placed at the correct distance from the plants to be effective (in addition, the correct colour bulb must also be used). After 18 months of research and tinkering, I came up with the idea of inverting the usual relationship between the artificial light and the plants. Instead of placing the lights over the plants, I surrounded the light with plants. Light from a bulb shines in all directions. By surrounding the bulb with plants I was able to capture and make use of a much higher percentage of the light emitted by the bulb. This maximises the number of plants that can be grown, while at the same time ensuring that the plants are at an optimal distance from the bulb. An additional benefit of this design is that the light emitted from the bulb can help our plants grow and at the same time light up our home or office. The leaves of the plant in effect act as a living lamp shade. The cube is also designed to be easily rotated so all sides get evenly exposed to the sunlight that comes in through the window. We recommend placing the system as close to the window as possible to capture sunlight and only turning on the light bulb in the evening as you would ordinarily do to light up your room as it gets dark. This eliminates the environmental impact as there is no additional electricity consumed. To make the most efficient use of space we developed a vertical structure that can grow three times as many plants in the same space. This compact space saving design is modular and stackable, enabling increased density. 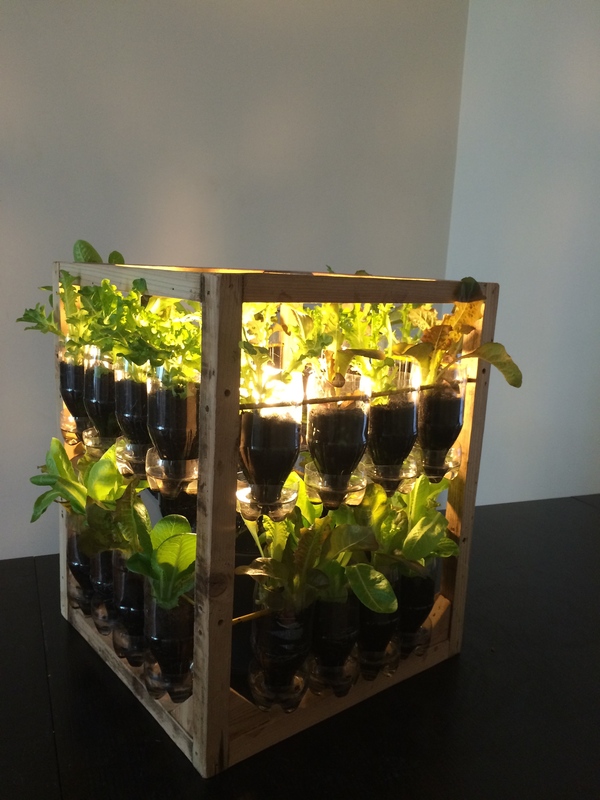 The system is designed to grow baby leaf lettuce and herbs for salad. It can also be used to grow spinach or certain varieties of leafy Asian greens. It is not suitable for large vegetables or those that require high levels of light intensity. Individual leaves can be harvested to make a fresh salad whenever you like. While we wanted the system to be highly optimised to promote plant growth, we are also committed to minimising its environmental impact. As such, we decided to construct it entirely of up cycled waste material. The frame is made of reclaimed wood from pallets and bamboo. The containers are made of re-configured Coke bottles. By using compost to grow the vegetables we can also help to reduce the amount of food waste thrown into our landfills. The containers incorporate a water reservoir so the plants only need to be watered once per week thereby reducing maintenance. Once you acquire the knowledge and skills to grow you own vegetables, it is a delight to simply harvest the fresh lettuce you’ve grown and create a “farm to table” experience right in your own home. This design project demonstrates that it is not only possible to improve functionality, aesthetics and durability (in comparison with products in the market), but to do so with 100% upcycled waste materials. It redefines sustainable design by creating a useful, attractive product that has a negative carbon footprint. We are currently working on adding different sustainable finishes to wood. If you would like to purchase a Solarium window garden, or organise or attend a workshop to build your own and learn how to grow your own vegetables, please email faihui@gmail.com.